What Does Your Pencil Case Say About You? this year make sure your pencil case represents your personality to the fullest. Pencil cases are an easy and fun way to express yourself at school. It can be a great feeling to choose a new one during the summer holiday and fill it with new pens, pencils and stationery goodies, ready for the start of a new term. But how do you choose the best one to suit your style, with so many on offer? Ryman Stationery has a wide range of pencil cases to get your personality shining. Whether you’re mad about mermaids, the ultimate hipster or more of a traditionalist, Ryman has something for you. You are the lover of everything eccentric. The first of your friends to find the latest thing, where the next pop-up shop is, and you always know what is happening around you. You will try everything once, constantly looking for new experiences and this is what your friends love you for. With the Rainbow Fluffy Pencil Case (£5.99) you will make your individual statement. This term stand out from the crowd and set the trend. You’re a true classic, a straight-laced kind of person. For you, everything has a straightforward working order and that is how you approach your studies. You are organised, level-headed and never get stressed with upcoming assignments because you had them finished days before. You have long-term goals and direction and the Flat Triple Pocket Pencil Case Assorted Zip (£3.99) is ideal for keeping things simple and organised. With a love of everything magical, you see the world through rose-tinted glasses and your merry disposition is the reason why people are so drawn to you. You have a way about you that is calming and create a good feeling for those around you and your pencil case will do the same thing. 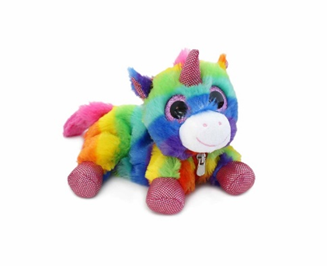 The Unicorn Plush Rainbow Pencil Case (£6.99) will have your friends smiling just like you. Curious, mysterious and strong, you are intrigued by the unknown and love exploring. 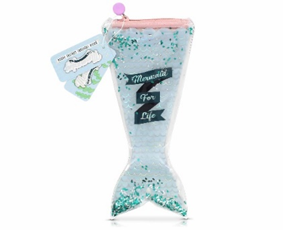 The Mermaid Tail Squishy Pouch Pencil Case (£11.99) is ideal for those that love the mystifying hidden depths of the deep blue sea and love to leave a bit of sparkle wherever they go. You live and breathe video games. It’s how you spend the majority of your free time, immersed in the action and lost in the world of your games. With the Helix Controller Pencil Case (£4.99) you can take a little bit of your world with you to school. Out of all of your friends you are always the most fashion forward, you read fashion magazines daily and know what is next to hit the high-street. Your friends are always asking your advice on what they should wear, and you are always kind and constructive with your advice. 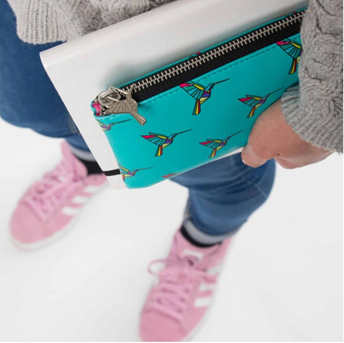 With the Marble Print Love Pencil Case (£4.99) you can keep putting your best fashion foot forward with pride. 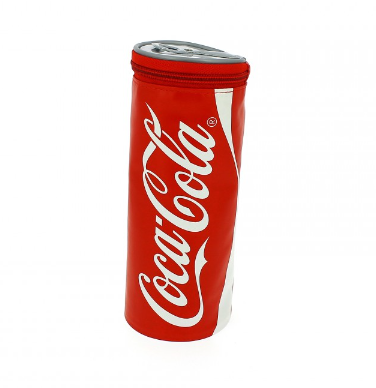 The Coca-Cola Pencil Case (£5.99) is the one for those who are partial to a sweet treat. A fizzy drink at the cinema or a sneaky bar of chocolate in your school bag, just to help you through the day. You love everything about the great outdoors. Whatever the weather, you are out there facing the elements, seeing how far you can push your body. You have a strong adventurous side and love to explore. A life filled with exhilaration is the life for you and with the Camo 2 Zip Pencil Case (£5.99) you can add an element of excitement to your school day. So, this year make sure your pencil case represents your personality to the fullest. This press release was distributed by ResponseSource Press Release Wire on behalf of Ryman Stationery in the following categories: Children & Teenagers, Entertainment & Arts, Leisure & Hobbies, Women's Interest & Beauty, Consumer Technology, Education & Human Resources, Retail & Fashion, for more information visit https://pressreleasewire.responsesource.com/about.